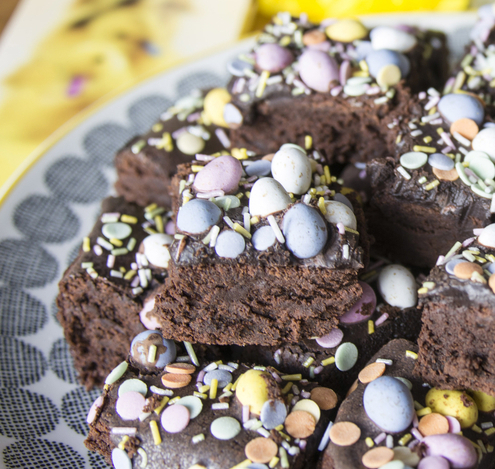 These brownies use a fairly store-cupboard selection of ingredients to make the world’s most chocolatey brownie with no actual chocolate in the mix. The Food Thoughts Cacao Powder more than compensates for the omission of melted chocolate and the high proportion of both butter and sugar make for a perfectly sticky, fudgy brownie. 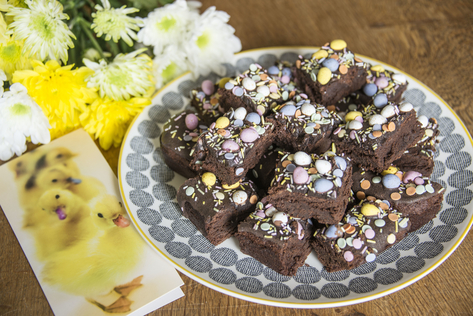 I have decorated mine for Easter using the tiniest chocolate eggs that I could find but there is nothing wrong with leaving the brownies naked. The finished brownie will be a little sunken in the middle but please do not be tempted to bake for longer to compensate – the sinking is part of the charm and guarantees the gooiest centre. Begin by melting the butter. I do this carefully in the microwave – use a microwave proof bowl and melt in 30 second bursts, checking after each 30 seconds and stopping once only a few small lumps of butter remain. A quick stir will melt these last bits. Weigh sugar, Food Thoughts Cacao Powder, and salt into a mixing bowl. Pour the melted butter onto these ingredients and mix for 3 minutes until nicely combined. Because of the high sugar content, the mix may look a bit grainy but this is normal. I use a freestanding mixer with paddle attachment for this job. Crack eggs into a smaller bowl and measure in the vanilla extract. Add these to the chocolatey mixture and beat for a further 2 minutes to combine. The mixture should look glossy by now. Add flour to the mixture and beat until completely combined, with no hidden pockets of flour in the bottom of the bowl. A quick scrape around the bowl with a spatula should prevent this. Pour the brownie mixture into a prepared cake tin or brownie tin. If you are using a metal tin, it is worth lining the tin with greaseproof paper so that the cooked brownie can be removed! I have a wonderful silicone cake tin that I use for this job which needs no lining. Bake in a preheated oven for 20 minutes. The brownie may look a little wobbly in the centre when you take the tin out of the oven but will firm up as it cools. Allow the brownie to cool completely in the tin before attempting to remove it. Mix icing sugar, Food Thoughts Cacao Powder and a little water together to make a chocolatey glace icing. Spread this over your brownie and use as an adhesive for as many colourful sugar sprinkles and Easter-themed treats as you can find! Allow the icing to set before cutting into slabs.